Shafiquddin is lost in thought. He is sitting on a wooden bench at the corner of a potholed road in Benazir Colony, a part of Karachi’s Orangi Town, staring absent-mindedly at everyone who walks by. The area appears poor, quiet and desolate. No industrial or commercial concerns operate here. Only a few scattered shops dot the streets. Local residents mostly stay within their own neighbourhood. No cars are seen driving around, no buses seen plying in Benazir Colony. When Shafiquddin begins to talk, others around him shout him down. No matter what party runs the country, they say, the people of Orangi Town will always be neglected. He shrugs them off and continues: in 1974, he moved with his family to Karachi from Chittagong, Bangladesh, and found a job at a factory near the then recently developed Port Qasim seaport (as did many others who had migrated with him). He never had any trouble getting to work because his employer always sent buses to pick up the workers. Those days are long gone. The residents of Benazir Colony either have to walk for a couple of kilometres to get to a bus stand or they hail an autorickshaw to go to a nearby main road where they can find public buses. A few years ago, the provincial government started running buses that connected the colony with the rest of the city but those ran on Compressed Natural Gas (CNG) and have stopped operating since gas stocks have run out. Those who can find buses more frequently and easily than the residents of Benazir Colony have other complaints. On an unusually hot day last month, Maryam Zulfiqar, a 25-year-old student, is riding a bus to go to a private institute on Karachi’s Tipu Sultan Road where she studies Arabic language. She left her home in Future Colony within the city’s southeastern working-class area, Landhi, at 8 am. It normally takes her at least an hour – provided there are no traffic jams – to complete the 15-kilometre journey. At 5 pm, she will travel back: same route, same distance but in the opposite direction. Clara has mastered the art of negotiating these problems, perfected over years of travelling on public transport in Karachi. In her mid-fifties now, she climbs on to a bus on a recent weekday with an ageless swiftness and finds a seat in the women’s section. She has been travelling on the same route for almost 17 years — taking a bus from Malir Cantt, close to the Jinnah International Airport, heading to the Pakistan Air Force Museum on Sharae Faisal where she works as a janitor. There are, indeed, too many vehicles on the roads — even when the number of buses has decreased. Clara, however, makes only part of her journey on the bus. She uses either an autorickshaw or a motorcycle rickshaw to travel the eight to 10 kilometres between her home and Malir Cantt. The time she requires for her two-way daily journey, about 37 kilometres long, depends, mostly, on the way the bus moves. “If [the driver] keeps slowing down at every small stop then we keep getting stuck in traffic which results in me reaching my destination in 45 minutes,” she says. The bus that Clara takes every day picks up commuters from Mohammad Khan Colony in Orangi Town, located on the north-western part of Karachi, moves across the city diagonally and finally stops at Hazrat Bilal Colony, the largest neighbourhood in the Korangi area to the south-east. The bus makes stops at several major areas, including Nazimabad, Hassan Square, Karsaz, Drigh Road and Malir. It drives past the traffic and mayhem of Quaidabad, moves through Landhi and lurches towards its last stop in Korangi. Travelling this entire 31-kilometre route takes at least two hours. Clara is happy, though. “If it were not for this bus, how would I get to work?” she asks with a smile. A mother of seven and a grandmother to “numerous grandchildren”, she needs to keep working and feels blessed that the bus helps her do that, costing only 30-40 rupees for a round trip. Strikes and political unrest in the city highlight the importance of buses even further for commuters like Clara who then either have to stay home or use costlier means of transport such as autorickshaws and taxis. 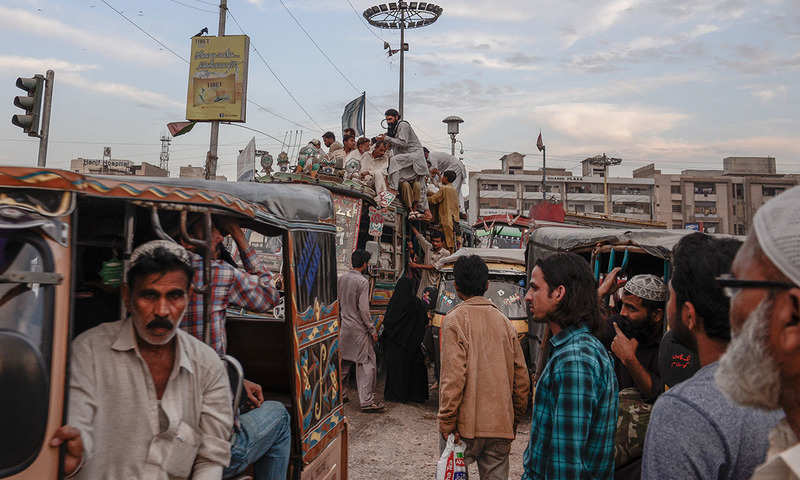 Transporters keep their vehicles off the roads in uncertain situations because Karachi has a long and tragic history of transport-related violence. A college girl’s death in 1985 after she was hit by a bus and the subsequent riots, in which scores were killed and hundreds of vehicles set on fire, was the first instance. Karachi has an estimated population of nearly 24 million, according to a study done by the Japan International Corporation Agency (JICA) in 2012. The city has nearly 6,457 buses of various sizes operating on 150 routes. It also has 2,715 contract carriages, buses and luxury coaches that organisations and individuals can hire for temporary transportation, the study adds. 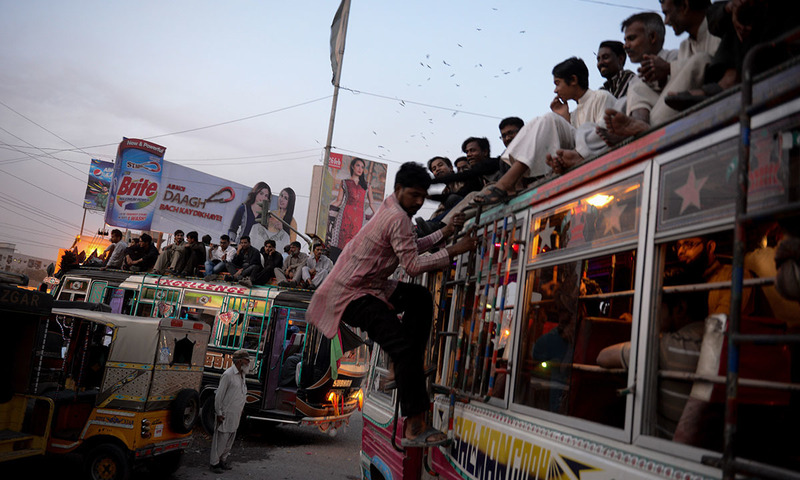 And these are not the only modes of transport on the city’s roads: minibuses, taxi cabs, autorickshaws, multiple-seat motorcycle rickshaws, private cars, motorcycles, school buses, private vans, ambulances, tankers, mini-trucks — anything that can run on an engine attached to wheels can be seen plying in Karachi. When architect and urban planner Arif Hasan and engineer Mansoor Raza came out with a study, Karachi: The Transport Crisis, in January 2015, one of their findings appeared counter-intuitive. In a city clogged with all different kinds of vehicles, they found the number of public transport buses having declined between 2011 and 2014 — from 22,313 to 12,399. Out of the buses that still exist, they write, only 9,527 are operative. Others remain off the road because of the CNG shortage, lack of funding and absence of security. 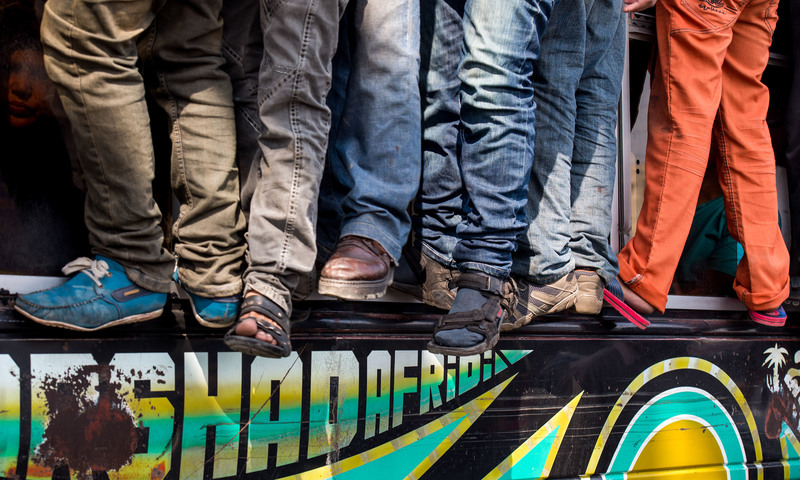 “ … Due to this decline, people are forced to travel on the roofs of buses which is, strictly speaking, illegal and [they have to] wait at bus stops for long periods to get a ride,” the study states. There are, indeed, too many vehicles on the roads — even when the number of buses has decreased. According to the transport and communication department at the Karachi Metropolitan Corporation, there were around 3.127 million registered vehicles in Karachi by December 31, 2013. And this number is increasing at a staggering rate: 283,277 vehicles were registered only in 2013 out of which 71 per cent were motorcycles. In 2015 alone, 1,000 motorcycles were registered per day, says Hasan. While the number of vehicles on Karachi’s roads is increasing by leaps and bounds, the number of traffic police personnel has remained stagnant. 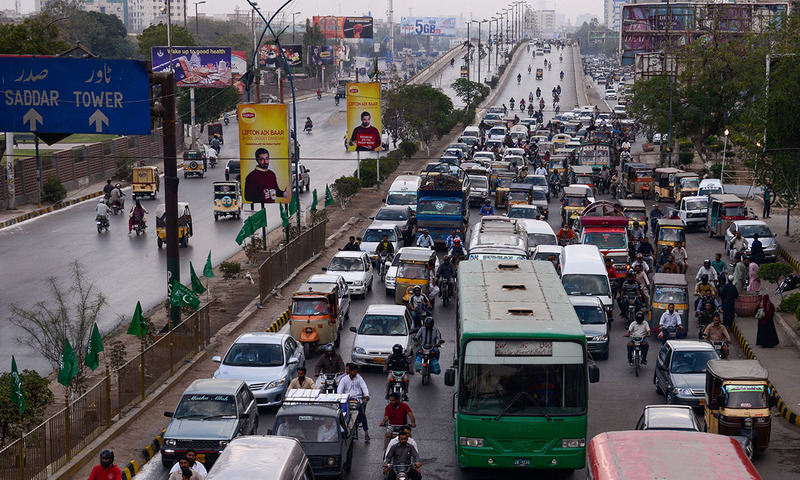 There are 3,200 policemen on traffic duty in the city when it needs an “additional 5,000 to regulate traffic” according to the authors of Karachi: The Transport Crisis. The other problem arising out of the number of vehicles is environmental pollution. In theory, every vehicle has to get a fitness certificate from the Vehicular Emission Control Programme (VECP), started by the Sindh Environmental Protection Agency (Sepa). In practice, these certificates are either forged or procured by bribing government officials. The lack of coordination among government agencies, however, ensures that no one gets caught and punished for driving a vehicle without a fitness certificate. "This is a question of city planning. Not just of transport planning,” says Arif Hasan. The JICA study insists the answer to all these problems is a system of transport that can help people transit from one part of the city en masse to another. 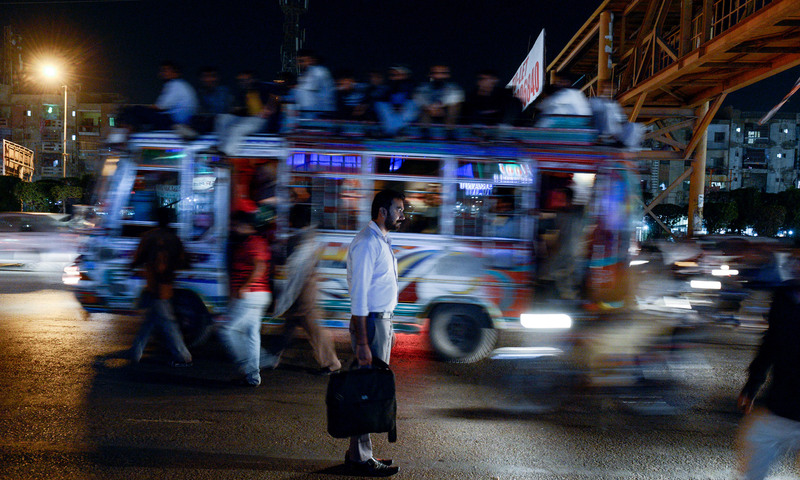 Karachi, JICA's study says, is one of the few metropolitan cities in the world without a mass transit system. If it continues to expand at its current rate, it will become the second largest city in the world by 2030 with Tokyo, Japan, at number one — in other words, the largest city without a mass transit system. Everyone – from the officials at the mass transit department at Karachi’s Civic Centre, which houses the offices of the city administration, to architects, urban planners, commuters and transporters – agrees that there is an “immediate” need for Karachi to have a smooth, sustainable and feasible mass transit system. The Civic Centre opposite Hassan Square in Gulshan-e-Iqbal area is a concrete jungle. A large multi-storey complex consisting of interconnected buildings seems to be sagging under the weight of the problems of a rapidly growing city. Away from its main entrance, approached through congested alleys blocked by motorcycles and visitors, is the entrance to a building where Karachi’s mass transit department is situated in a corner on the sixth floor. On February 3, 2016, this department made an announcement in newspapers that Karachi will soon have a mass transit system comprising a Green Line, an Orange Line, a Yellow Line and a Red Line — as part of a mass transit development plan JICA devised in 2012. The proposed system includes the construction of six Bus Rapid Transits (BRTs), two Metro Rapid Transits (MRTs) and the revival of the Karachi Circular Railway (KCR) which was originally established in 1964. Fazal Khatri, the director of the mass transit department since 2013, sits in his office, signing documents and answering his phone, which buzzes every few minutes. A man of nearly 35 years of experience and nearing retirement, Khatri says his department recently gave a presentation to Sindh Governor Dr Ishratul Ebad on the ongoing and proposed public transport projects. In order to ensure these projects benefit the people of the city, he says, public hearings have been organised to elicit the point of view of the “real” stakeholders. “We want to know what the public would do differently or if the current plan even suits them,” Khatri says. Two out of the six proposed BRTs are at early stages of implementation: utility relocation for the Orange Line has started in front of the Jinnah University for Women in North Nazimabad. 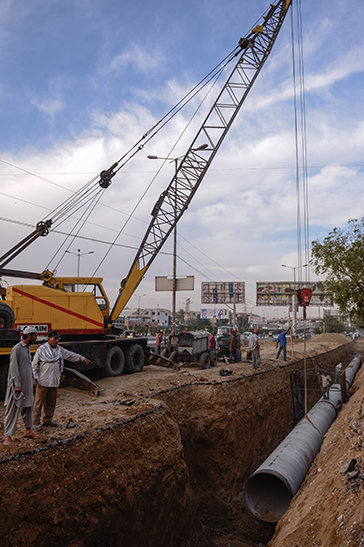 Water pipes, gas lines and electric wires are being relocated to facilitate construction for the BRT which will run right in the centre of the existing roads. The shortest of the six proposed lines, the 2.2 kilometre Orange Line will begin near the Board Office in Nazimabad, heading northwest towards the Town Municipal Office in Orangi. The Sindh government will fund this entire line, estimated to cost 2.4 billion rupees and expected to benefit 50,000 people a day. The deadline for its completion is the end of 2016. The construction of a 17-kilometre elevated Green Line is also underway after Prime Minister Nawaz Sharif inaugurated it late last month. It starts at Guru Mandir – in the south of the city – and goes all the way to the K-Electric Power House in Surjani Town in North Karachi. The Green Line intersects the Orange Line near the Board Office and is expected to benefit 300,000 passengers every day. Funded entirely by the federal government, it is expected to cost 16.6 billion rupees. "I don’t think it is feasible to move all these people”. Arif Hasan remains pessimistic about the KCR’s revival. The 26-kilometre long Yellow Line is in the planning stage and will be built under a public-private partnership. Khatri says an agreement will be signed soon with the China National Electric Company – the private partner in the project – which will be responsible for arranging 40 per cent of the funding. The Sindh government will provide the rest of the money. Khatri expects the project to be completed by 2018, though this looks ambitious given that construction work has not even started. The remaining projects under JICA's proposal have not entered the planning phase. Even those which are well underway may fizzle out considering Karachi’s troubled development history. Political interference and the unavailability of money, either together or separately, have been the most significant stumbling blocks in almost all previously failed public transport projects. And these two factors can still lead to a similar outcome. The KCR, too, once worked smoothly but then ran aground due to financial constraints. It became a full circle of 44 kilometres in 1970 and connected Karachi’s four main work areas: the port, the Sindh Industrial and Trading Estate, the city’s central commercial areas (such as Saddar) and the Landhi Industrial Area. In the mid-1980s, however, it started facing multiple problems, lack of maintenance being the most important of them. These problems had a negative impact on the quality of the services provided by the KCR and resulted in a reduction in the frequency of trains. Together, the two developments led to major financial losses which continued piling up for years, finally forcing the KCR to shut down in December 1999. On the other hand, political reasons foiled Karachi’s initial attempts to develop a mass transit system. The Karachi Master Plan of 1975-1978 proposed the development of a light rail mass transit system along with “upgrading the Circular Railway … pushing it into the suburbs through a number of spurs.” The proposed system was to be “partly underground, partly elevated and partly at grade metro.” All these plans, however, came to naught in 1977 after the removal of Zulfikar Ali Bhutto’s government in a military coup, according to Karachi: The Transport Crisis. In 1990, the World Bank devised the Karachi Mass Transit Programme that preferred a bus rapid system over a rail-based mass transit system. The programme never took off because the politicians in power wanted a rail not a bus. No donors or contractors, however, showed any interest in what the politicians asked for. The third attempt to create a mass transit system was made in 2005 – with JICA’s technical and financial support. It envisaged six BRTs linked to the KCR – essentially what is being implemented now after remaining on paper for more than a decade. One good thing to come out of it is a detailed study, published in 2012, which now serves as a master plan for all current and future public transport projects in Karachi. A family physician in Lahore, Dr Arif Hasan, opened his private clinic opposite the historic Shalimar Gardens, in January 1981. Hasan Clinic has provided healthcare to more than 200 patients a day for 35 years. Some of his patients have been visiting his clinic since they were children. On January 9 this year, the Lahore Development Authority (LDA) knocked at Hasan Clinic’s door and told Dr Hasan to vacate it in seven days to make way for the Orange Line Metro Train project under construction in different parts of Lahore. He thought of moving the court to delay, if not stop, his eviction. He did not get time for that. The very next day at around noon, a contingent of police along with an LDA director showed up at the clinic and began removing equipment. Dr Hasan claims the government officials dragged out patients even when some of them were on intravenous drips and he lost equipment worth millions of rupees. The LDA officials razed the clinic in front of his eyes, along with many other adjacent businesses. The proprietors of some of those businesses were not even present; others say they had court orders against the demolition. The government has been informing people about the impending eviction since October last year, says the chief engineer of the Orange Line project. All of them insist the LDA violated the law while demolishing their businesses. The Land Acquisition Act of 1894, they say, necessitates that the government give a seven-day written eviction notice to the owner of a property to be acquired for a public project. No such notices were given to them — this is at least what the evicted people claim. When Israar Saeed, the chief engineer of the Orange Line project at the LDA, is asked about the demolition without notice of Hasan Clinic and its adjacent businesses he says simply that “this is not true.” The government has been informing people about the impending eviction since October last year, he says. Other officials claim most of the demolished buildings were, indeed, encroachments on public land and, therefore, needed no prior notice for their demolition. 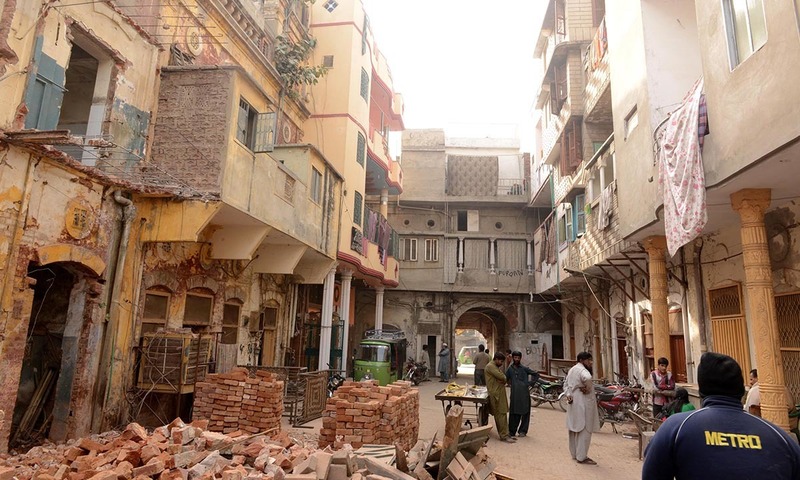 Attiq Ahmed, an architect and urban designer, runs a think tank called Office of Conservation and Community Outreach in Lahore (OCCO) and has been working on conserving Lahore’s architectural heritage for some years. He has made demographic maps of many historical areas of the city along the entire route of the Metro Bus. 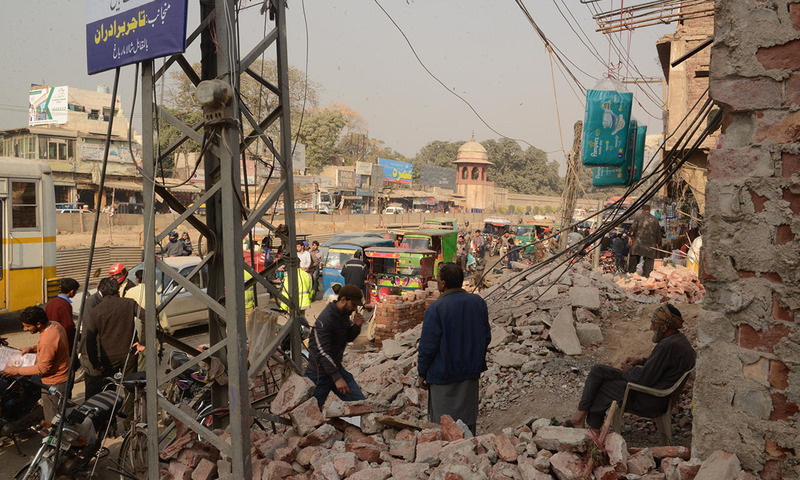 He insists that most buildings demolished near the Shalimar Gardens, including Hasan Clinic, were not encroachments. 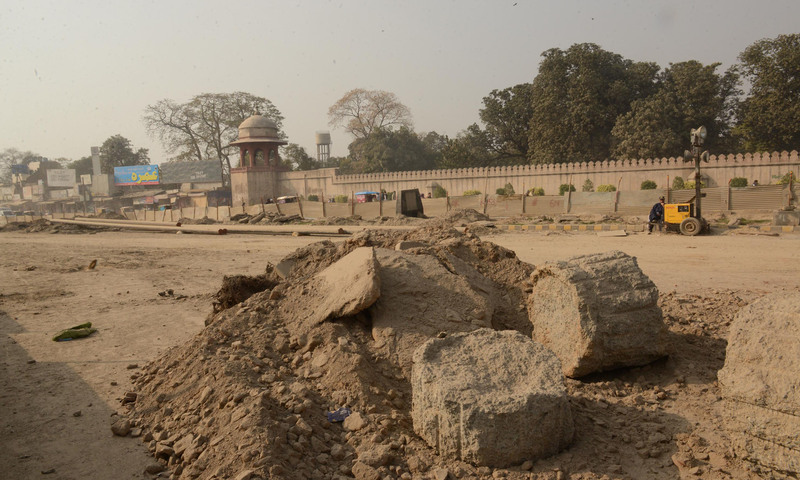 More than a month after the demolition, rubble still adorns the road in front of the Shalimar Gardens. 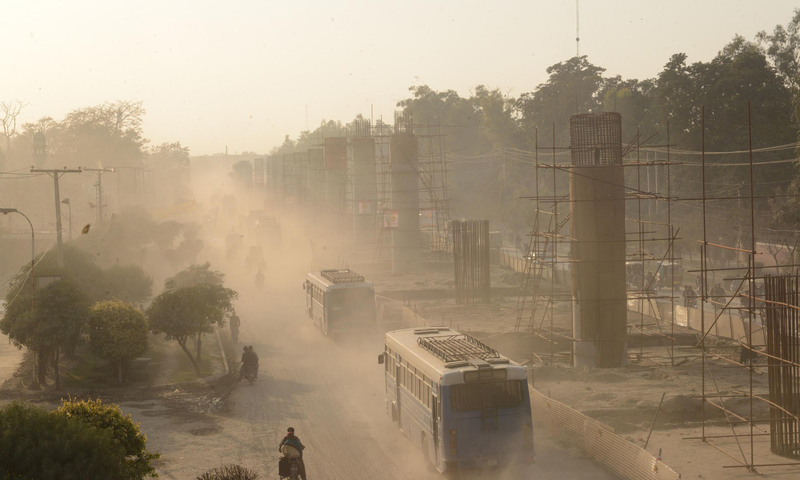 Elsewhere in Lahore, the construction process for the 27.1-kilometre long and mostly elevated train track – which will link Dera Gujjran on the north-east of Lahore to Ali Town at the south-western end of the city – is leaving similar problems in its wake. Work on the project started in November 2015 and has picked up pace in recent weeks to meet the end of the year deadline for completion. To maintain a faster pace, government officials in many cases are cutting corners to acquire the required land — as the case of Hasan Clinic suggests. The Orange Line will pass by such historic sites as Chauburji, Anarkali, Jain Mandir, the General Post Office, the Supreme Court of Pakistan’s Lahore registry, the Lahore High Court, Lakshmi Chowk and Lahore Railway Station. The track will have a 1.7-kilometre long ‘semi-underground’ section – crossing the gardens of the 155-year-old St Andrews Presbyterian Church, The Mall, the Lahore High Court and the Supreme Court registry – using what architects call ‘cut and cover’ technology. Despite being underground, this section “will destroy everything on the surface in its path” according to documents OCCO has shared with the Herald. No new construction can happen within 200 feet of a site listed as protected under these laws and there are 25 such sites located on the train’s route. Some parts of the track also violate the National Antiquities Act 1975 and/or the Punjab Special Premises (Preservation) Ordinance 1985, the documents point out. No new construction can happen within 200 feet of a site listed as protected under these laws and there are 25 such sites located on the train’s route, the documents add. In the case of the Shalimar Gardens, the World Heritage Convention 1972 mandates that the train line should be at least 250 feet away from the site — a provision not being followed. The way the government is handling these projects is not the only thing baffling architects, urban planners and community members across Lahore. They are also worried about an official disregard for technical advice: JICA's report had originally proposed that seven kilometres of the train track – from Chauburji to GT Road – should be underground. The government says going underground would have increased the cost of the project by 0.15 billion dollars — from 1.6 billion dollars to 1.75 billion dollars. Those living in the buildings around Jain Mandir are packing up and leaving after having received compensation money for their properties, taken over by the government for construction of the train track. 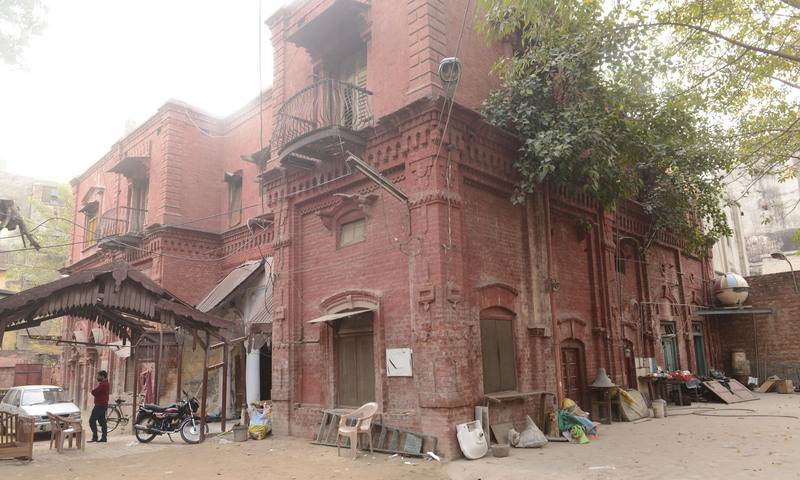 Kapurthala House and Bengali Building, both British-era structures, are being demolished. Many other newer structures around them, including shops, have already been razed. Many of those who have either already left the area, or are in the process of leaving, complain that they never received written notices as per the law for evacuating their properties. They say they were informed verbally. Others complain that the LDA officers visited them in person, in some cases even intimidating and threatening them. Also read: Why care about public art? That still does not alleviate the pain many are feeling at having to leave the places they had called home for decades. Many others have been living in the area since 1947, sometimes sharing crumbling and cramped single-room lodgings with 10 other members of their families in buildings left behind by Hindus after the partition. Kashif Siddiq is one of them. He cries as his home near Kapurthala House is pulled down. A little further, a 110-year-old imambargah is being demolished. Nargis Zaidi, the imambargah’s caretaker, does not know if compensation money will help her overcome her loss. “What do you do when your identity and entire history is taken away from you?” she asks. This might be true, at least for the 380,000 or so people who travel every day by the Metro Bus which has been operational since early 2013. Its 27-kilometre track is uncluttered, the ticketing system is efficient and the neat and tidy buses run every two minutes (to keep things this way, though, the Punjab government massively subsidises the bus service, pumping four million rupees into it every day). “What do you do when your identity and entire history is taken away from you?” Says Nargis Zaidi, the imambargah’s caretaker. Mehvish Khadim, 21, travels daily from her home in Shahdara, in the north of Lahore, to work at a salon in Gulberg. Her commute begins at 10:30 am and by 11:45 am she is walking into her workplace. The Metro Bus has allowed many women from working-class areas to get jobs in posh neighbourhoods like Gulberg, she says. Back in Old Anarkali, an elderly woman preparing to leave her home breaks down more than once. “We were refugees when we came here in 1947. It feels like we have become refugees once again,” she says. Shafiquddin retired over seven years ago and spends most of his waking time at the same spot on the road every day. He does not venture out of Benazir Colony unless circumstances force him to. When he is told about a mass transit public transport system being planned in Karachi that will connect Orangi to the rest of the city, those around him hope the project will bring energy and prosperity back to their otherwise isolated, rundown neighbourhood. The plan, unlike the ones in Lahore, envisages little demolition but it requires massive investment in creating the required physical infrastructure such as roads, flyovers and underpasses. There is neither time nor money for that, says architect Hasan. Even with all the required money being somehow available, the plans will take a lot of time to materialise. “Delhi took about a decade to build a mass transit system; Bangkok took about 16 years,” he says. “Karachi may build two BRTs in the next decade and a half. Those will benefit about three per cent of the city’s population. What will happen to the rest of the city?” he wonders. The problems surrounding the KCR, the central hub of the mass transit plans, are even more entrenched. Most importantly, it requires relocating 5,000 families and paying them a compensation that satisfies their relocation needs. Massive encroachment of the train track is another major problem. 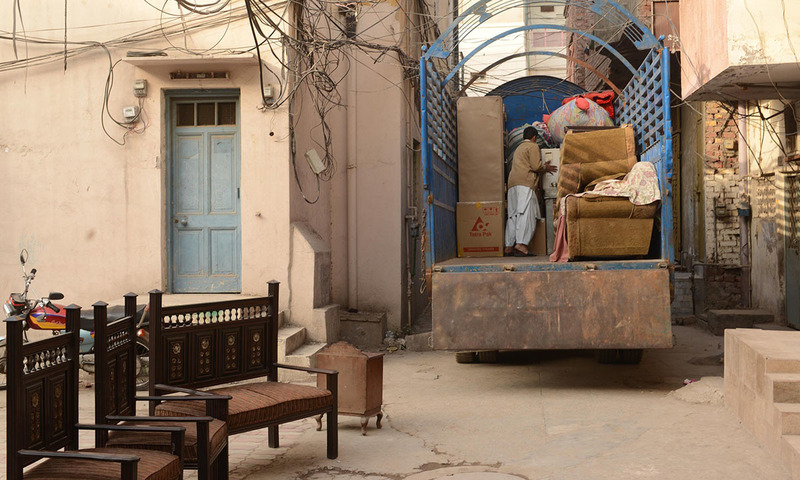 According to the Karachi Urban Transport Corporation, which is the entity responsible for the KCR revival, 20 per cent of the KCR track has been encroached upon by squatters and illegal occupants who will also require relocation. Given the populist political culture of Karachi, Hasan says, “I don’t think it is feasible to move all these people.” He remains pessimistic about the KCR’s revival. According to Hasan, Karachi immediately needs some transport system that is cheap and practical and that can be upgraded incrementally overtime. He suggests increasing the number of buses operating in the city and creating separate lanes for them. “The government can provide loans to bus operators to purchase more buses.” He also wants the government to establish a training school for drivers and conductors to improve their skills and make them better aware of the need for following traffic laws. “This will bring great relief within two years,” Hasan says. In a city where the mass transit department is a small part of the city’s administration, building BRTs and reviving local railways is not just a matter of building elevated roads and removing encroachments. It will require coordination among many public and private entities; and a joint effort by many parts of the city administration, not just the transport-related entities which, so far, have been trying to plan and implement all the various projects single-handedly. “This is a question of city planning. Not just of transport planning,” says Hasan. Khatri agrees. It is very difficult for a few of us to manage all the tasks, he says and adds that the Sindh Mass Transit Authority is being planned along the lines of the Punjab Metro Bus Authority. It, however, seems to be taking ages to materialise. 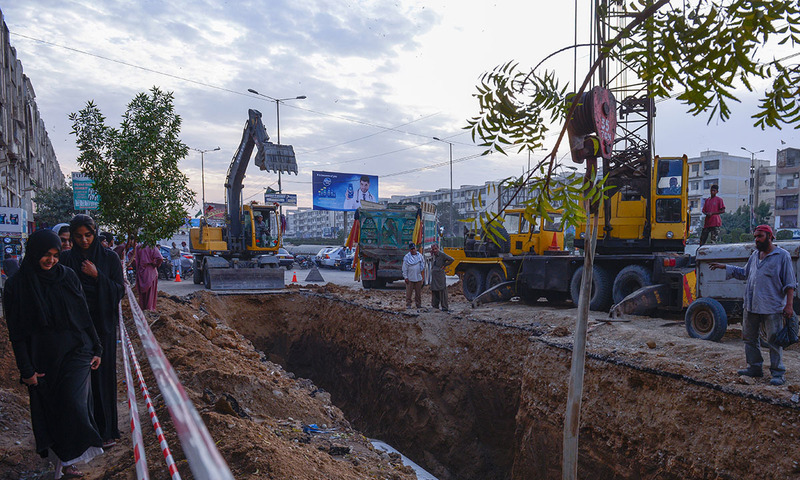 Syed Mohammad Taha, the engineer in charge of the Karachi BRT corridors, is watching utility relocation work at the Jinnah University for Women on a crisp spring afternoon last month. When asked if this is the best way to have a public transport system in Karachi, he admits it is not. “But it is certainly a step forward,” he says. This was originally published in Herald's March 2016 issue. To read more subscribe to the Herald in print. Sometimes one wonders what are the priorities of our newspapers and journalists. Routinely read such articles rightfully pointing at the lack of transport in karachi. As a positive step when federal government started green metro line, the same papers are condemning it for cutting trees. Is there a way to keep the press satisfied. China has made buses that run over the cars. Its four wheels (on the left and right side) are near the curbs, and in the middle, it is so high that cars can easily pass underneath. We need those buses. No matter how huge they are they don't interrupt the usual traffic on the road. Since the most important part of these busses is very high and wide body, it can be easily built in Pakistan. That is one thing Pakistan can be a specialist at, and can even export to other countries. the experts and budget for urban planning are badly needed in pak....as we are approaching to a condition in 2030 when 50 percent of our population will be residing in urban sattlements. @D : Based on the way the water and the gas pipelines are currently created, the way the construction has been done on congested areas, there is hardly room and time to go underground, especially now. Once a few BRT lines are operational, underground trains could be the next step. But more than that, we need to start developing new smaller cities. @Agha Ata : We can have something running like that on Sharae Faisal and other main roads. The major issue that I see is a traffic accident where some rouge drive hits the bus threatening the lives on many passengers. A good article, its Urdu translation needs to be published in Urdu news papers in Karachi so that people of this city realize that they themselves are responsible for this pathetic state by voting for useless candidates and parties. Karachi should unite and initiate mass protest against governments in Sindh and Centre for criminal negligence of city. They should demand independent administrative unit for Karachi with its legislative assembly with control on city resources and carry out short and long term planning to give decent infrastructure and amenities to the citizens. In the independent city government politicians will not be able to exploit voters on ethnic and sectarian bases. Karachi will be really a metropolitan city its institutions represented by all the groups. @Rashid cutting trees to make way for another man made project is no justification, when we do not care for environmental degradation. No where in the world trees are cut down to make new roads. Had you visited any European country or American city, you would appreciate the way they conserve their trees because it helps control pollution. Karachi gas a multi facet problems. Transport is just one if them. Employment is the biggest problem due to which young boys are forced into street crimes and also used by other forces. That is the reason, if you compare Karachi with Lahore which has more position than the city of Karachi, it has less street crimes and lawlessness, because employment situation is better than Karachi. Hence, people are better off and per capita income us better than Karachi. On the top of it, the provincial govt is awashed in corruption loot and plunder. Mismanagement is their hallmark which has been highlighted by the CJ of SC also. They have been unable to spend Rs 200 billion of develoomwnt fund from last year budget, so what one can expect from them. Its really ridiculous to right such a thing against progress every where in the world in every construction project s properties come under needs to be demolished what's special in case of Lahore orange line?news paper is getting unnecessary worried about the old properties of the people alone the rout I. Paris metro pass nearer to all historic sites we Pakistani have only problems with development shame on us. Time to end the blame game! The introduction of Pakistan’s first mass transit system in Lahore was questioned without realising that Lahore is in dire need of a good transportation strategy. Every country requires modern and efficient infrastructure to speed up the wheels of progress. The countries that realised the need of infrastructure have advanced in the race of progress, while those who undermined its significance present a vulnerable picture of transport system today. Gladly, Lahore has advanced in the field of infrastructure development by after the Orange Line Metro Train, which is under-construction. The asset of Orange Train will revolutionise the transport sector. It will uplift the living standards of common people by providing economical, timesaving and dignified ride for all and sundry. The blame was not only falsified with facts and figures but it also addressed how Orange Line Metro Train is the most heritage-friendly mass transit system in the world. It is quoted that temples were destroyed in India. The cultural hearts of Athens, Rome, Berlin, Paris, Kuala Lumpur and London have metro trains functional at a distance less than buses running near historical buildings in Lahore. But Orange Train will travel at a safe distance, 80km/h as its average speed, creating GBV of 0.03 mm/s which cannot harm the historical buildings at any cost. The ball of blame kept rolling with the blame that Orange Line Metro Train Project is going to steal the greenery of the city, but these claims were also negated as Orange Train project will make Lahore 10 times greener. For every tree being cut 10 trees will be planted as compensation. Along with that Orange Train will liberate Lahore from carbon emitting buses, vans and rickshaws. It will also combat traffic congestion, traffic jams and gridlocks which the civil society forgot while raising their groundless animadversions. 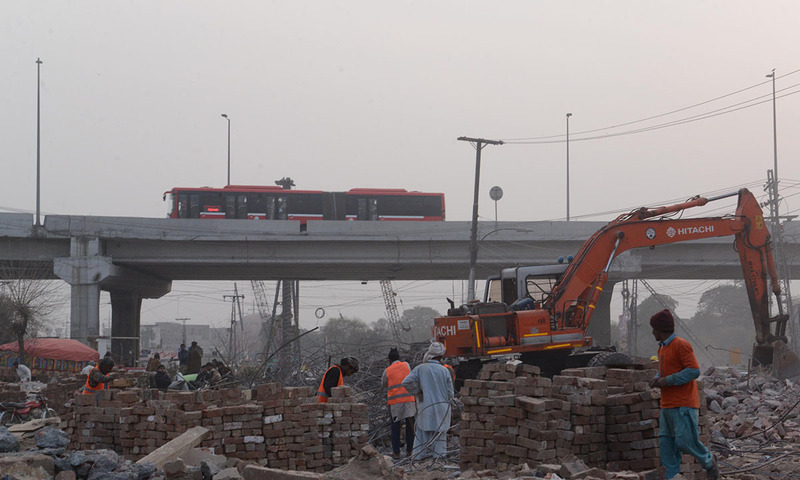 The sprinkling foes also criticised Lahore Metro Train for illegal acquisition of land but they once again failed in their conspiracy as the displaced were not displeased. The people who had to sacrifice their land were given compensation for that. It is fascinating that the land owners did not only get their due amount but additional amount was also given to them as compensation for construction. @Rana lahorites need better hospitals and child care. Visit govt run hospitals especially Cardiology center where poor people are given 1 year appointment for only ECG. Can u imagine this kind of mismanagement in govt run hospitals ? Have you been to Paris. 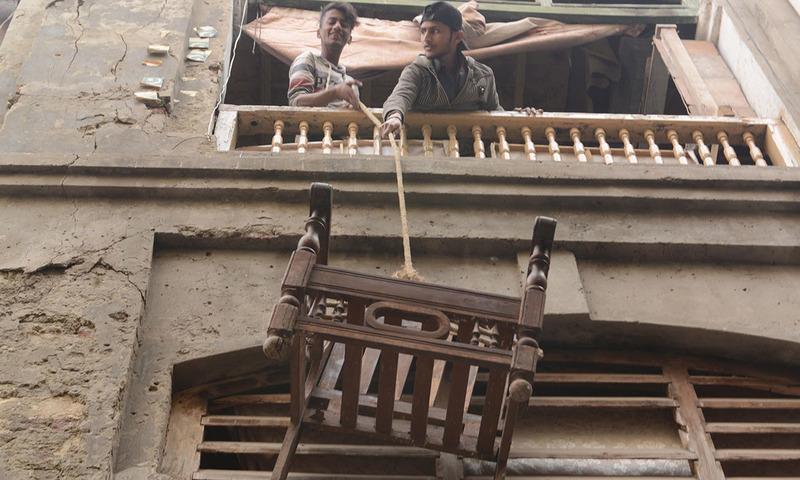 It is by law that they cannot pull down any old historical structure anywhere in the city. Even the façade cannot be touched. They can build anything behind the façade. Not in the front of any historical structure or façade. That is how they have preserved their culture. While we are trying to justify. The architect in Lahore who argues no trains are needed because most people work within 5km of their homes completely out of touch with reality. If they only work 5km from their homes, it probably is not because of choice but because they have no options. Public transit stitches a city together, and opens up employment opportunities for people who would otherwise be strictly limited to working within 5km of their homes. Nobody is interested in the plight of this mega city. Every other insitution, party, or entity see it with the lens of its vested interests. The city that runs Pakistan is simply neglected so its people who work day and night to pay the taxes having no rights to manage it by themselves.